If you know me well, you know that I really like staying at W Hotels. I’ve stayed at ones in New York, Hong Kong, Seattle, Santiago, Chicago, Atlanta, and Montreal previously. With there being a W Hotel in Bangkok, I had a pretty good idea where I was going to wind up staying. Especially when I was able to grab a SPG Cash AND Points award for US$75 + 5,000 points per night for my two night stay. 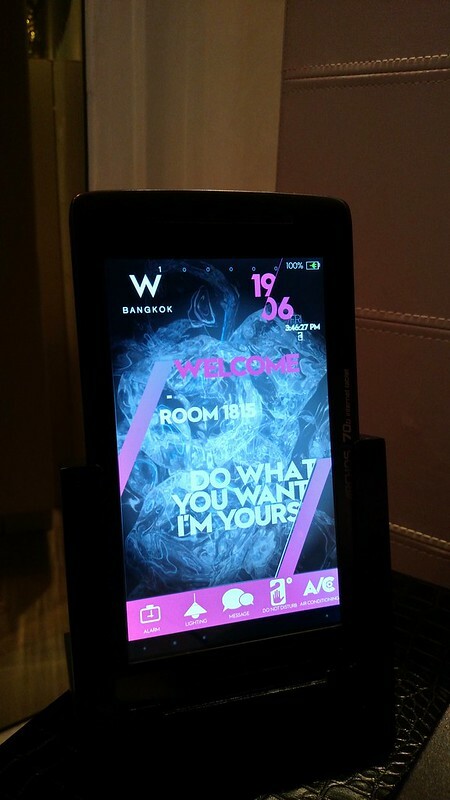 I arrived at the W Bangkok via a taxi that I had hired from the airport, taking about 30-45 minutes. Pulling up, it has what I would call a pretty typical W Hotel exterior; modern, grey, and large doors opening up to the lobby. 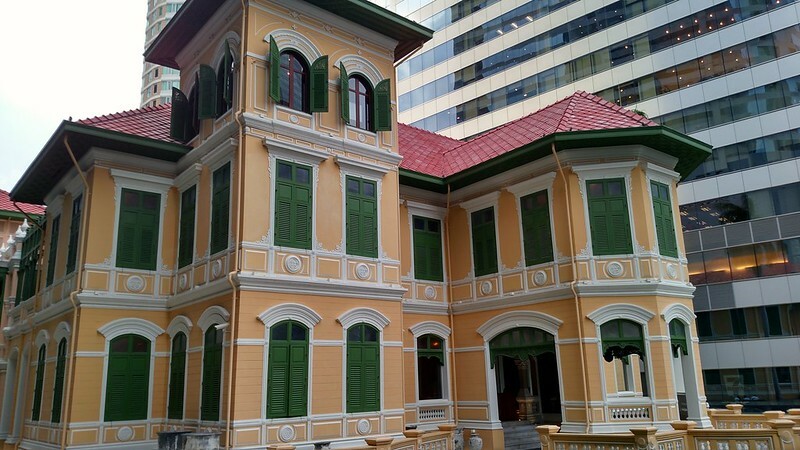 What does make pulling up to this hotel though a little bit different is that right next to the modern hotel building, is the historic colonial style building that once housed the Russian Embassy to Thailand. 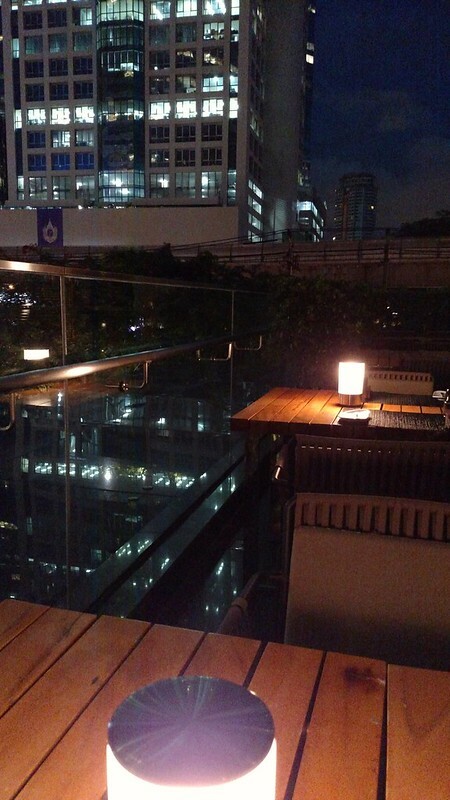 As a note, this building has since opened up as The House on Sathorn, with dining options, a bar, and function spaces; when I was there it had not yet been opened as a transformed space. I was helped with my bags into the very W-esque and large lobby, heading straight for the first available front desk agent. She was able to check me in quickly and had informed me that I had been upgraded from the Wonderful to Spectacular Room. I’m always glad to get an upgrade, and soon enough I was heading up to my room with one of the bellhops carting my heavy duffel to the 18th floor. Typically, an upgrade to a Spectacular Room isn’t really much to write home about. 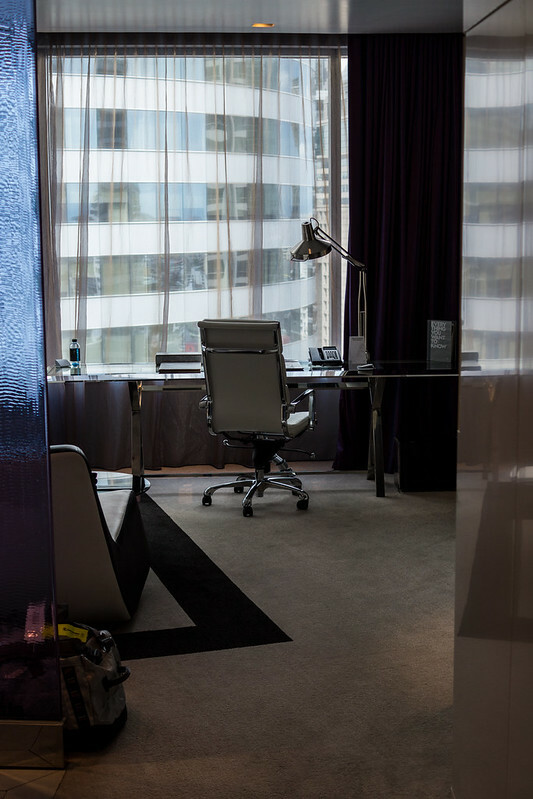 These are usually identical to the Wonderful Rooms at a number of W Hotels, but often just a higher floor or with a better view. It does help though for us Golds to feel a little bit more special however when we get ‘upgraded’ to these rooms! 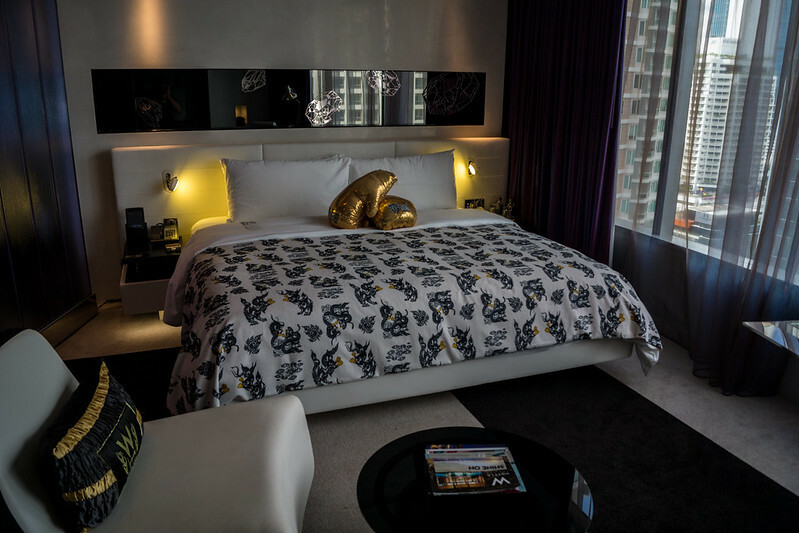 Now, at the W Bangkok, the Spectacular and Wonderful rooms appear to be similarly outfitted, but there is one difference that sets them apart: the room shape. The Spectacular Rooms are more triangular shaped (or more like a really skewed trapezoid), with it being narrow towards the door and opening outwards at the bed and window. 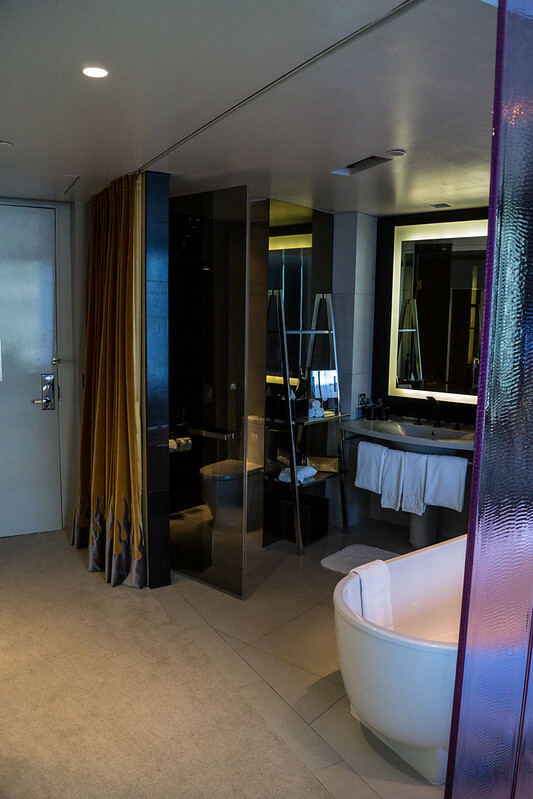 The Bathroom was not physically separate from the rest of the room aside from a colored divider between the room and the tub and shower and a door for the toilet. There was a curtain one could pull across the opening that spanned from the front door to the bedroom area, if some privacy was desired. Being a solo traveler, that wasn’t exactly a problem for me! I found the bathroom to be of decent sized, plenty of counter space (for my few things), and with a shower with ample pressure and temperature. 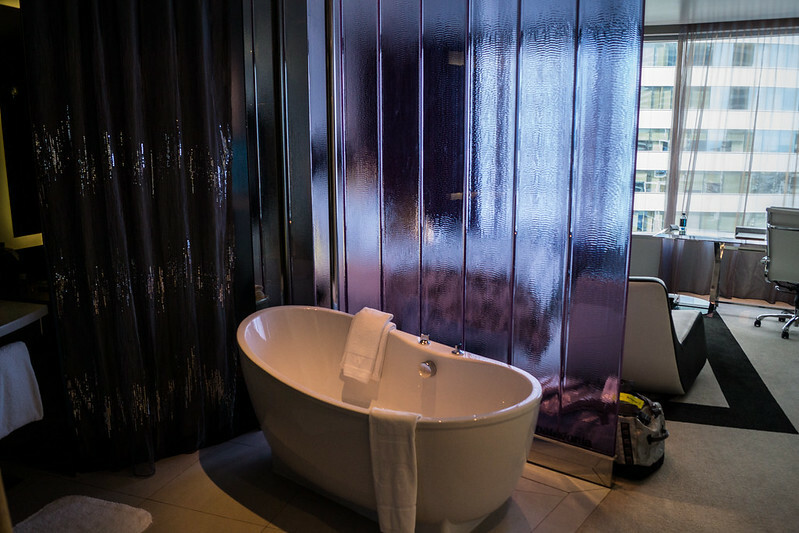 I never did use the tub during my stay, but having flown a good distance, my first activity was to jump in the shower and wash off all that travel funk! One thing of note is that this is one of the few hotels that I’ve stayed at that have a tablet-like remote that controls all the features in the room, from lights to curtains to air conditioning and more. It could be a convenience, say if you were working all evening at the desk and didn’t want to necessarily get up to adjust those things. Or you just want to lay in bed and open the shades just a tad to start letting the morning light in! 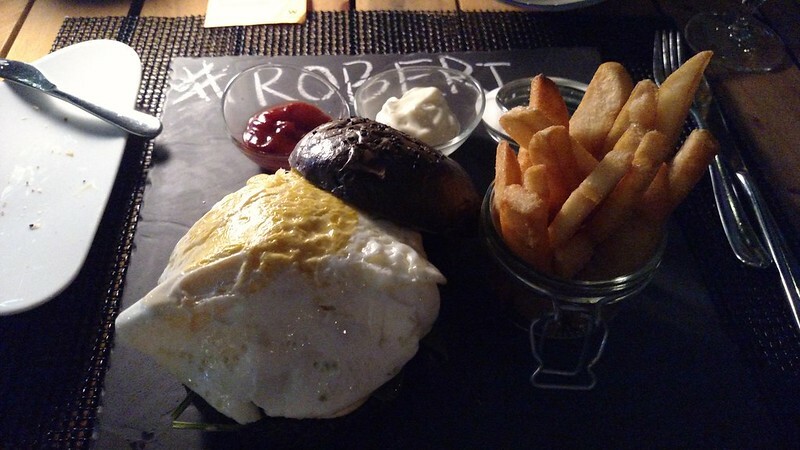 I sat down at the Kitchen Table one evening to sit outside and partake in the “My Burger, My Style” offer, which was basically design your own burger starting at 550THB (or ~US$15) and also included one beverage. I went crazy filling out the form; going with lamb, adding an egg on top, and what is this, a squid-ink bun? Sure, why not! Sometimes, choices are a bad thing, and I may have went a little crazy, but it was a pretty solid burger. And the squid-ink bun that was black didn’t really taste any different compared to a normal bun. The one thing that was probably not the best idea? Sitting outside on that hot and muggy night, especially since I was going to be outside all evening. Probably should have relished a few minutes in the AC, but then I wouldn’t have enjoyed the sounds of the city! The Kitchen Table also does breakfast, which I did partake in on my last morning. It was fairly comprehensive with a number of Western and Asian options, and overall was good. It didn’t really overly wow me though like the spread at the W Hong Kong, but it still did the trick. As for drinking there, seeing as I was given a voucher for a drink upon check-in, I decided to head over to WOOBAR, which is right off the lobby on the ground floor. This is the second time that I’ve been to a WOOBAR in an W Hotel, and like my first experience at the W Hong Kong, it was fairly quiet when I showed up. Of course I was just here to kick off my evening before heading out, but at that early evening hour, it was nice calm and relaxed. I’m sure as the night rolled on though, the place picked up and got busy. On the plus side, since it was a little bit calmer, I was able to chat with the bartender for a bit and try some new cocktails. Can’t complain about that! 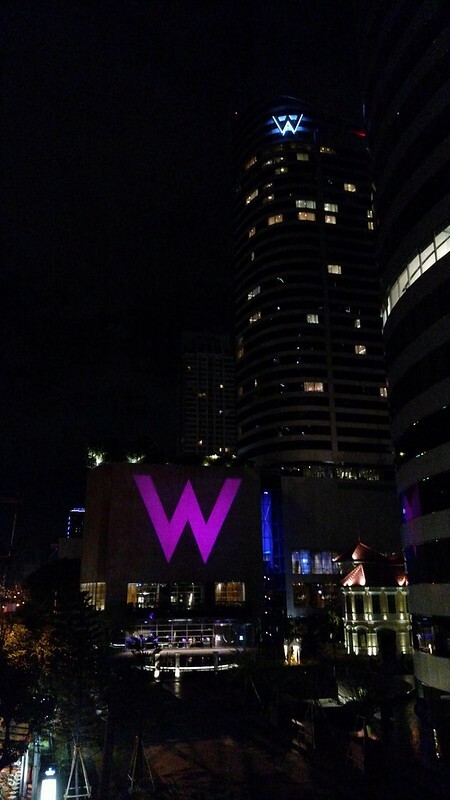 The W Bangkok definitely hits the W brand in all the right ways; it feels like a W Hotel through and through. It was a comfortable stay in that it was familiar in all the right ways while being a little bit new. The staff were all equally eager to help out and were not slacking in any which way. The location is great for getting around; the metro station is located just on the opposite side of a neighboring office building, no more than a 5 minute walk. The river for taking a boat to some of the tourist sites is only 20 minutes on foot. The only way the location would be better is if it was on the river. 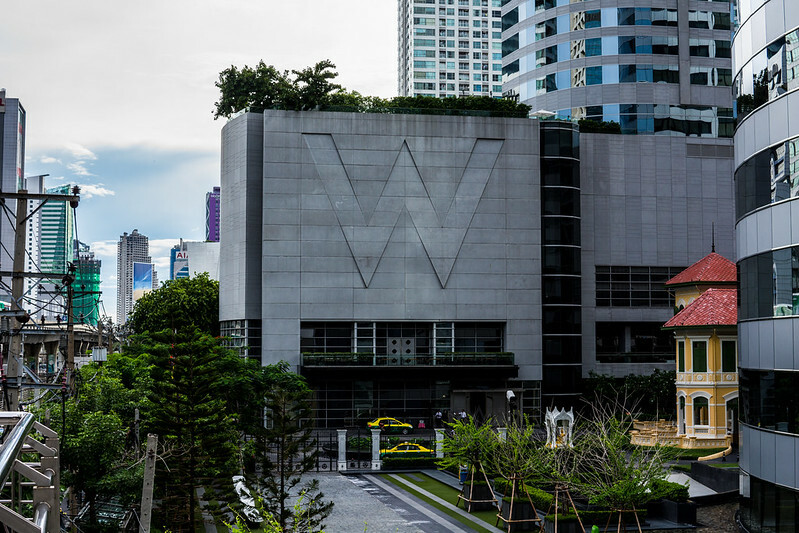 In the end, you basically can’t go wrong by picking the W Bangkok for a stay in this city! This entry was posted in Asia, Hotels, RTW, SPG, Thailand, Travel, Trip Report. Bookmark the permalink. Follow any comments here with the RSS feed for this post. Post a comment or leave a trackback: Trackback URL.